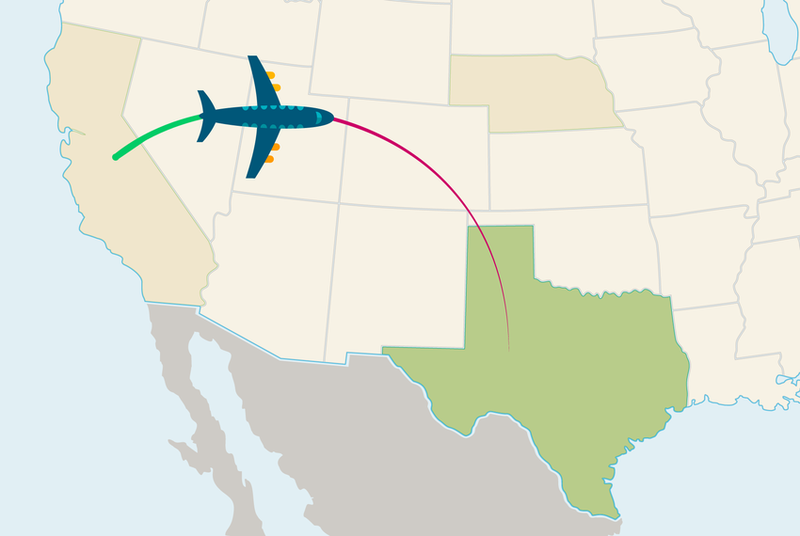 The decision to ban California state employee travel could have an effect on Texas' ability to host California teams and NCAA championship events. But no one knows for sure. The politicians running Texas and California continue to prove that they want nothing to do with each other. But athletes in the two states are inextricably linked. As a result, the latest salvo in the Texas v. California culture wars has created widespread confusion in the college sports world. That confusion stems from a decision this week by California Attorney General Xavier Becerra to ban state-funded employee travel to Texas. Becerra said that a new Texas law discriminates against LGBT people and that California law bans state-funded travel to states with discriminatory laws on the books. But while the move was applauded by liberals in California and mocked by conservatives in Texas, its future impact is unclear. A lot is at stake for sports fans — from the championship dreams of California teams to the future of championship matches in Texas. Still, many government officials, university leaders and business groups contacted by the Tribune on Friday said they had no idea how the decision would play out. “It’s too early to know the direct impact,” said Mike Rosen, a University of Houston spokesman. The main question being asked is simple: Does the ban apply to the coaches of California public university teams? Those coaches clearly need to travel to Texas. California teams regularly schedule games in Texas. And the state’s ample supply of talented athletes — especially football players — means that coaches from California frequently come here to recruit. Currently, the football rosters at the University of California, Los Angeles; the University of California, Berkeley and San Jose State University have Texans. In addition, Texas is a regular host of NCAA postseason events that California teams aspire to compete in. San Antonio is hosting the 2018 Men’s NCAA Final Four, for example. And AT&T Stadium in Arlington regularly hosts games in the College Football Playoff. The coaches are also clearly state employees. But for at least in some cases, their travel costs aren’t covered by state appropriations. Earlier this year, a UCLA spokesman told The Daily Bruin student newspaper that its athletics program doesn’t receive any state funding. School officials didn’t return requests for comment Friday, but they have said in the past that they don’t have any plans to keep its athletes out of postseason games in banned states. That talk is a relief to the organizers of postseason events in Texas. If it were impossible for California coaches to travel here, it would seem unlikely that NCAA events would continue to be hosted here. “We are hopeful that some postseason sporting events might be exempted,” said Jessica Shortall, managing director of Texas Competes, a coalition of businesses and chambers of commerce that argues that Texas businesses need their state to be welcoming to LGBT people. The law also has a few exceptions that could preserve upcoming Texas games for California teams. For example, contracts that require travel and were signed before the ban went into place can still be honored. That likely means that the football game in Austin between San Jose State University and the University of Texas at Austin on Sept. 9 is still on. But California public schools may not be able to schedule any future regular-season games in Texas if the ban stays in place. UCLA officials have previously said they won’t plan any such games in the future. In the meantime, Republican Texas politicians were defiant in the face of California’s ban. Meanwhile, other lawmakers openly considered a reciprocal ban against Texas-funded travel to California. Rep. Dustin Burrows, R-Lubbock, proposed such an idea during the most recent regular session of the Texas Legislature. It never received a full vote on the House floor, but he says he hopes to try to find a way to bring the issue up when lawmakers reconvene for a special session next month. Disclosure: The University of Houston and University of Texas at Austin have been financial supporters of The Texas Tribune. A complete list of Tribune donors and sponsors is available here.